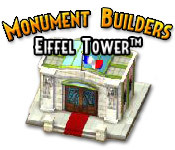 Monument Builders: Eiffel Tower is rated 2.9 out of 5 by 59. Rated 5 out of 5 by barbiecats2000 from An Excellent Delivery Game I think fishies have been fooled by many of reviews because this is not really a building game. This is a delivery type game. 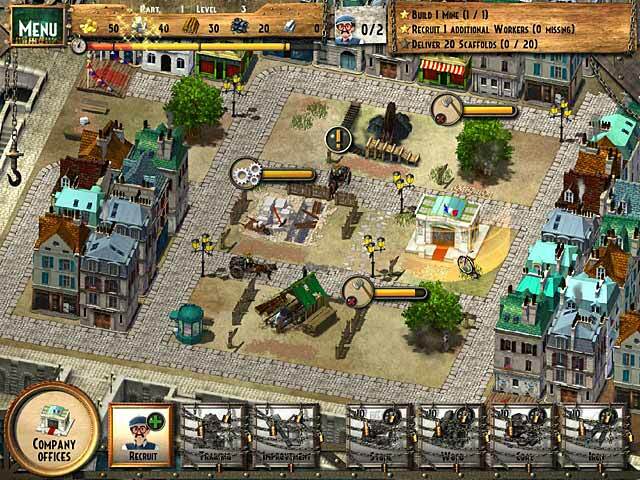 There are several other delivery games out there such as the Virtual City series. I am facinated by this game in many repects. The levels can all be completed but if you want Gold you may have to play several times so you can process the correct order of things. The strategy required is very thought provoking. Don't be fooled by the reviews here or on the forum pages because I think too many missed exactly what kind of game this is. I highly recommend this game for those who like a good challenge. 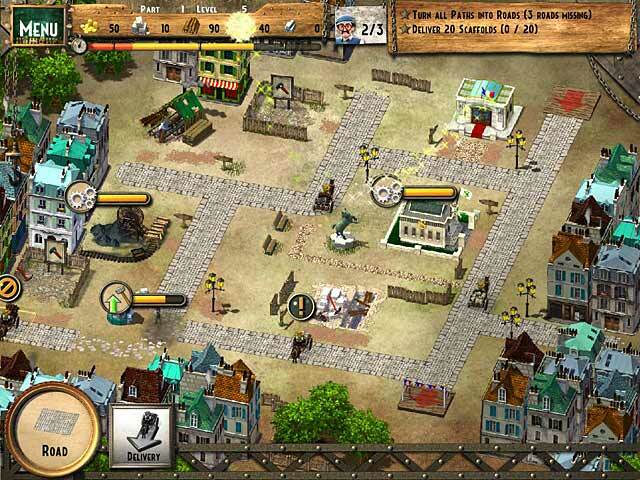 Rated 5 out of 5 by ndeletari from Monument Builders: Eiffel Tower Amazing game. I really loved it. Fantastic levels. Rated 5 out of 5 by jiferin from Not what you think At first I struggled with this game. I was treating it like a time management, but it is acctually more of a strategy game. Once I got used to it I found it fun and challenging. Follow the directions and don't assume you know whats going on and you will have a great game time! Rated 5 out of 5 by goofygran from try it but don't be fooled by the first few easy levels. Just wondering how many people gave up on this game before it got good. I almost didn't download it because of the negative reviews. The hour trial doesn't even give a hint of how challenging some of the levels are and if anyone says they got to level 4+ on the trial then I don't know how cos I've been playing for a couple of days now and I'm still on 4-3 (and stuck btw) Although there is not the variety of commodities to make like in farm frenzy and not as many building types as in some other TM games, the challenge in this is a logic puzzle and not a speed click thing. Although you do have to be smartish on some of the levels. All in all it doesn't deserve the slating it got in those first reviews and I suspect that some of the reviewers didn't give it a chance.. it's thumbs up from me. Rated 5 out of 5 by SmokeyMtnLinda from Great Game ... lots of fun! What a great, unique themed game. Lots of fun for hours .... actually now I'm going on days. I didn't think construction work could be so enjoyable and knowledgable. The main thing I really like is that no matter what your speed, you can finish the game. For those that like a challenge, it's also there. I've played through, then came back again to try for gold; so far, no luck on the gold. I guess it's different strokes for different folks, but I like the graphics, gameplay and of the the history lesson. It is definately worth a try. Rated 5 out of 5 by tsfuller from Fun Game Loved it! Great ideas and wonderful graphics! Rated 5 out of 5 by VERNA_MAY from Nice game I liked the fact that this game was different that the other games of this type that I have played. It isn't overly simple, but it doesn't start our ridiculously hard. 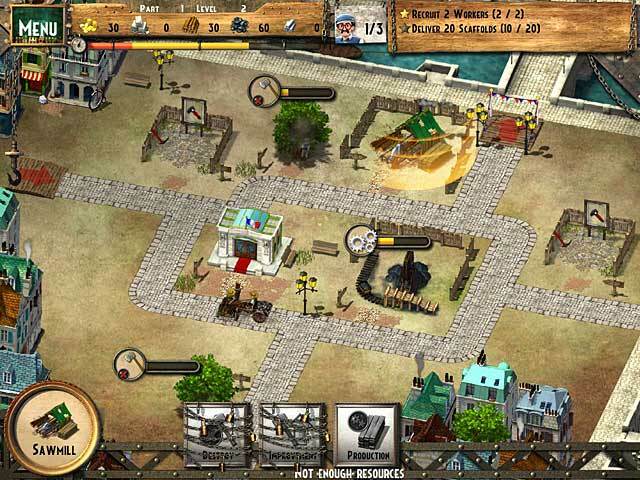 Rated 4 out of 5 by mb2139 from Love games like this I am looking forward to all of the monument builder series. Rated 4 out of 5 by piccolocv from Good Game This was a challenging game. i like to get expert on every level and on some i just had to give up after 5 tries. It got repetitive near the end...and a little long. but still good. Rated 4 out of 5 by lindiana from Interesting Game I enjoyed this game. I must say the level of challenge was not particularly high but sometimes that is nice when you want to have some fun. I also liked that it was educational with all the information about the Eiffel Tower included within the game. If the Eiffel Tower is ever a Category on Jeopardy, I'm ready! I was able to get gold on all the levels except the two where you have to do a great deal of clicking to kill some thieves. All that multiple clicking is difficult for me, makes me lose all the sensation in my fingers. However on the whole it was not a major click fest as some of these games tend to run. The levels were repetitive at times but each one had its own set goal and gave you something to work for as I enjoy those type of challenges: here is your goal now go accomplish it. I have played better games in this genre and I have played worse. I'd say this one is good if you are getting tired of all the HOGs and need a break. Enjoy!